The museum offers a variety of tour options designed to meet your specific classroom needs. Education tours are free for both students and chaperones. Please call to reserve a time for your tour. We will need to know the grade level and approximate number of students and chaperones to schedule a tour. Special arrangements are occasionally necessary to accommodate larger groups. Click here for location and directions. Click here to contact Joe Long, M.A. to schedule a tour. A guided tour of the main gallery takes about an hour, although shorter or longer programs can be arranged as needed. Tours can be coordinated with State Museum visits (separate admission policies may apply- contact their education department for more information) or visits to the South Carolina State House or other local attractions. Tours can also include Education Room programs on special topics by request. 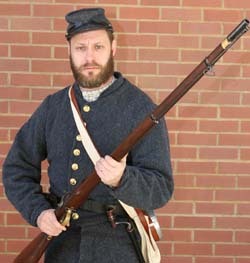 Uniformed tours are also available upon request.